Richmond Pacific Railroad's clean-diesel switch engine, the first of its kind in the U.S.
You gotta start somewhere. In this case, it's the BNSF switchyard in Richmond, where the Richmond Pacific Railroad is testing the nation's first "Tier 4" switch engine for certification. Tier 4 is a standard set by the federal Environmental Protection Agency for ultra-low emissions. The location couldn't be more appropriate, since Richmond is an industrial town with a major rail hub, a huge oil refinery and with housing right up against it all, a hotspot for air-quality-related health complaints such as asthma. "Even one locomotive can make a big impact in terms of health," says Damian Breen, who directs "strategic incentives" for the Bay Area Air Quality Management District. The District provided the railroad with a half-million-dollar grant to roll out and test the new switch engine, a smaller locomotive used to shuffle rail cars around in the yard or move them short distances. Breen says the new switcher will eliminate 6,000 tons of emissions per year. Of course, "clean" is a relative term in the railroad biz. Most locomotives are belching volcanoes of black soot, partly because they're typically powered by a single, huge diesel engine and spend a lot of their time idling. Instead, the new switcher has a series of smaller engines and generators, optimized by computer controls to call up only as much power as the moment demands. 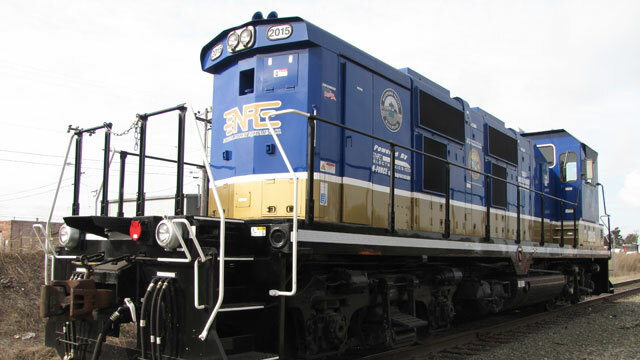 "It's really a new design concept," says Steve Sonni, California rep for the locomotive builder, NRE. He says the combination reduces noise, fuel consumption and stack emissions. "You're talking 30 to 40 percent for sure," he says, and adds that it could be 90 percent cleaner than many "legacy" locomotives that have been on the rails for 40 years or more. "I can assure you that there's hundreds and hundreds, if not thousands of old locomotives that were designed and built in the '50s and '60s operating all over the United States," says Sonni, many without any restrictions on emissions. 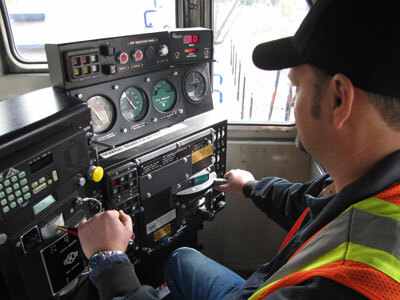 Jeff Schwab starts up the new ultra-quiet, low-emissions switch locomotive. Nobody seems more enthused about the new switcher than the guy in the cab. For one thing, "It's really quiet," says Jeff Schwab, the railroad's chief mechanic. "You have a computer monitoring everything, helping the engineer make decisions," he notes, such as a kind of traction control, where the computer will redistribute power to wheels to avoid wheels slipping, a common occurrence when switchers are hooked up to heavy loads. "It's just incredible." Breen says he also expects to see climate benefits from the new engine, as a major component of diesel exhaust is black carbon, which Breen calls "a major forcer of climate." Based on recent science, state regulators are recommending a stronger focus on black carbon as a greenhouse gas. Breen expects the switcher to save two metric tons of soot each year, reduce carbon dioxide emissions, and use less fuel overall. But with an estimated 550 switch engines operating in California, there would seem to be a long road ahead. "We are looking to see more of these locomotives deployed by the major railroads," says Breen, though he concedes that it's up to them to decide whether to adopt the cleaner engines. The new locomotives will become more widely available in 2015. "We have talked to them quite a bit about reducing risk in these communities," he added. "We know they are willing to work with us." At a cost upwards of $1 million for a single locomotive, that can be a tough sell.